Do you think it would add motivation to have students setup a long rational expression that models something (such as adding rates based on a single variable) and THEN evaluate at a few points as you suggest? Or is it better to just get directly to the headache phase? Then evaluate both versions for x = -1. Not the aspirin you are looking for I know, but I like to relate to things students can understand. If all cars come with tires, why would someone spend thousands to change the tires and rims? I think the range of answers from style to function are very similar to why mathematicians might simplify rational equations. I think all of the posts in this series have highlighted an important aspect math teachers tend to overlook about mathematics. All too often, math teachers are quick to say that mathematics is a subject that progress from the simple/concrete to the complex/abstract. There is some truth to this line of thinking and it certainly characterizes the approach many of us take towards crafting lessons and sequencing the scope of mathematics courses such as Algebra. Interestingly enough, most of the complex tasks that we tend to think of in math were developed by people seeking to simplify whatever mathematical problems/study they were currently facing. Simplifying expressions developed out of a need to make something as “ugly” as your given expression into something simpler to understand and evaluate. Mathematical proof developed out of a need to separate fact from fiction and to make simpler the complex task of knowing what is true from what is false. Functions developed to represent any one-to-one relationship in a form as simple and compact as an equation. My point is that when we looking as historical/logical development of mathematics, we observe that the novel developments we deem as “complex/abstract” were really the product of people attempting to make the math they were studying more understandable and simpler. By a creating a “headache” using a theory of need, we’re really looking back to the situations that prompted the development of the mathematics we intend students to learn. We’re attempting to place students in the position of the mathematician/scientist/logician/philosopher who was originally staring down a particular set of mathematics without a clue about where to go and developing a massive headache from his hours of attempt. I love this idea because it transcends any subject and students learn the value of the learning process. 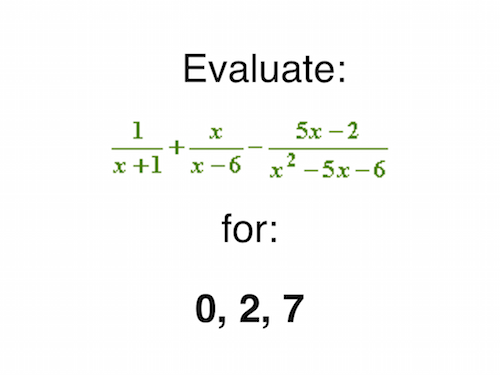 A student might not have a practical need for factoring trinomials in his/her daily life, but he/she will encounter situations where a problem might require breaking it down and simplifying it before attempting to solve it. What’s that funny buzzing my recharger when it’s going out…could it be the capacitor? Capacitors are all over the place. They make simple but interesting rational functions. This is one of those areas where (to me) we’re playing the mathematician’s what if game. The algebraic complexity we ask of students is like when we ask middle schoolers to subtract 17/168 from 61/130. There will never be a problem like that unless you make it up. If students can simplify two binomial over binomial fractions added/subtracted, that’s more than enough. Problems like the original one here would be interesting – maybe – to solve by regression in desmos to (ax+b)/(cx^2+dx+f) or even (ax+b)/(x^2-5x-6) recognizing the common denominator. I’ve always wondered, what skills are actually gained by this sort of problem? In an age of calculators, I’ve found that my kids have no interest to simplify expressions when they can solve it directly with a computer. (I’m not a math teacher, just a parent who loves math). Is there an actual math skill that’s being improved here, that is necessary for whatever comes after this lesson? I feel like maybe there is. But I also think we could be recreating 18th century handiwork only for the sake of tradition. Jeff, I have wrestled with this as well because if students are weak with fractions, rationals can be the end of the road for them. I see simplifying rational functions as a progression from breaking down and putting together integers. Young children learn 24 can be the sum or product of integers. Next, fractions can be the sum or product of fractions. Algebra students learn rational terms can also be written as sums and products. A footnote in Appendix A of the CCSS-M states, “In this course rational functions are limited to those whose numerators are of degree at most 1 and denominators of degree at most 2…” I think this restriction keeps the manipulations reasonably manageable. With younger kids, we often use this exact motivation to teach new operations or strategies. For example, if I have a kid who only wants to double to multiply, I give her a problem for which doubling is so grueling that I hope she’ll stop partway through and say, “This is taking forever! This is such a drag! There has to be an easier way!” Now she’s teachable, right? Now we can talk about working with groups of 10, rather than 2. But here’s what I’m chewing on. That’s MY practice, as a teacher. But have I made it HER practice, as a thinker? You’re making me wonder how explicit we should be about teaching kids the mental habit of 1) noticing when the math they’re doing is a drag, 2) stopping what they’re doing, and 3) wondering if there is a better way. It seems to me like we want to teach that thought process at least as much as we want to teach simplifying rational expressions. To improve this good idea, I would refrain from giving them the numbers to evaluate. If you give the numbers, they may believe you have worked it out before hand, which is possibly why you are getting the answers faster. Why not ask volunteers to give you three numbers that everyone in the class will evaluate, then write them on the board. Even though we don’t value speed in computation in the classroom, you can evaluate your simplified expressions by hand, at your desk, while they work, and put the post it notes up as you complete it. Then they will really wonder, how did you evaluate the expressions so much more quickly than us? The example you have used is what I would call “fake math”, as opposed to “real math”, following your views on “world” problems. Change one number in the quadratic bit and bang goes the “nice” result. Some effort is needed to find “real world” problems which yield messy yet simplifiable algebra. This would be more convincing. For the problem shown I would give them the solution shown and say “Can you make a better job of it?”. Also, the ease of calculation is not as important as the readability (which in this case is improved) as this sort of calculation is done by computers currently working at speeds measured in teraflops, that is in billions of floating point operations per second. “Real math” would also describe a situation in which the simplified version of the expression yielded some insight into the structure of the originating problem. A lot of the pushback on the factoring task would apply here as well. The headache/aspirin theory does not seem to be the impetus for the activity. Rather the activity seems to have been forced into the headache/aspirin packaging. Wouldn’t call it a theory, but a technique that can be useful is to reward computation practice. In this case, maybe choose a rational expression like: x/x+1 – 6/x-6 + x^2+2x-6/x^2-5x-6. Now the computation practice is reworded with the curious result that the “answer” is always “2”. First of all, the two expressions are not the same. E.g., the left side is not defined for x=-1. But that is not why I comment here. Sorry about the distraction. My first point is that we can do all this with software very easily, including the evaluation. To learn to write the thing into a software like EMT (Euler Math Toolbox) or into the web via Wolfram Alfa looks much more promising as a real world skill than doing it by hand. Secondly, the converse (partial fractions) has real world applications and is more interesting, though it can be done by software too. Summarizing: Students should know that these simplifications and their converses can be done. But they should not practice them besides some simple examples. Please continue your excellent track to make teaching better, more real world oriented, and most of all more interesting for the students! The most useful aspect of this skill set is not in doing problems like the one above but rather in using identities to simplify far more abstract expressions into equations that provide deep insight into aspects of a problem that matter and those that do not. Something that no computer factoring program can interpret, and for that matter, would choke on given too many variables. I’m speaking here from the point of view of a physicist and simplifying equations etc. but also from the point of view of calculus and proving fundamental results. You put it so much better. But school math seems to be happy to ignore such mathematical notions. I have told parents for the past few years that if I could revamp math education, I wouldn’t label my courses “Math”, but instead, “Problem Solving”. The bottom line is, you may never need to solve a problem of this magnitude, but when given the tools, you should be able to jump in know what steps to take. As teachers, that is what we do…provide the tools and experience with those tools, for when a student encounters a problem. They can pick through their toolbox and decide which tool is appropriate for each task. An auto mechanic can not fix every issue with a wrench…so he might have a red or black Craftsman 5 foot tall cabinet on wheels (I’m a visual person) full of tools for whatever comes his way. If he encounters a problem that he has never seen, but has tools that can be used on the parts that are broken, he will be able to work through the situation…tinker with it at the minimum. If he does not have the tool to even get to the broken part…the car will remain broken. I teach this as part of “function algebra”, working through function addition (with lines), showing that quadratics can be shown as function multiplication (a parabola is often the product of two lines), and then division. Our football team is doing a teeshirt fundraiser. We can get the shirts wholesale for $15 each. Getting our team logo printed on them is a fixed price of $75. So how much is the cost per teeshirt? The kids originally set up the linear equation–then I point out that this is total cost, not cost per tee. They usually work a few numbers and then realize it’s the linear equation divided by x. Then they run some numbers, realize that the more shirts bought, the less the price per tee. We talk about why–the $75 is fixed, so it’s allocated to each shirt. The more shirts, the lower each shirt cost–but of course, the greater the total cost. Also, no matter how many teeshirts, the cost can’t get below $15. So then I show it as two graphs (15x + 75) and x. Then we graph the division. At that point, I usually just skip on to practice (like you’ve outlined above). But this year, I’m thinking of going deeper. Then you could say something like: well, we want people to buy two or three shirts, not just one. We know that our breakeven price changes based on how many shirts we buy. How ambitious should we be? How much can we maybe convince people to buy more shirts by pricing attractively? How will adding these functions help us find optimal pricing? Why would you go anywhere near such a problem with students who don’t either like Maths, or are focused enough on doing it that they don’t care that they don’t like it? Obviously this is never going to be used in the real world. It’s an idealised problem designed to test a couple of specific concepts, in a way that can be marked consistently. We are testing students with these problems to see if they have the right combination of mathematical ability and dedication to study. Those that do will get entry into those subjects at university. Ordinary people, not intending to become engineers or scientists, should not be doing these in the first place. I advise students who don’t need this sort of thing just to avoid doing them — there are easier marks elsewhere that they are better to focus on. Even if you provide the “aspirin” that makes them want to do them, they will just get bogged down in technical errors. I’d argue that efficiency is an important reason for considering simplification of rational functions on it’s own. If you are working in a technical field, you may need to program and make computations with such a rational function. If the function is a small part of a much larger computation, it is computationally more efficient to algebraically manipulate the simplified expression and work with that. One could argue the actual skill of being able to do this simplification by hand is not necessary to teach. But this skill is just one piece in becoming proficient in algebraic manipulation. I think it’s a stretch to look for “cute” applications that make us feel as if it’d actually be used in some profession. It seems to me that someone taking this line of argument really means to argue that not *everyone* will need to be an algebra expert – and of course this is true. But in a world full of critical jobs (e.g. engineers, analysts, computational programming, bioinformatics researchers, etc.) demanding computational precision, it’s important that people in such positions be experts in employing algebraic manipulation and can confidently verify that their work is precise. Positions where creativity and higher order thinking are required are not positions where one can spend life “plugging in” to a computer, getting a mysterious output, and leaving it at that. For instance, a researcher in signal/image processing needs to apply higher order thinking to make novel progress – he/she must know what a Fast Fourier Transform does rather than just how to apply it to examples. And how can one expect to advance the vast modern applications of linear algebra without being an expert in elementary algebra? Though these people might not literally be simplifying rational functions by hand, they do need algebraic expertise for which simplification is foundational. Presumably, we don’t want to track children into certain jobs early in life. So we need to be realistic that students not going into professions requiring such algebraic proficiency will end up having to spend time learning them along side those that do. We all have to learn skills in the other sciences that we don’t use; I had to learn how to analyze NMR spectra in organic chem and about various biological processes in high school but I ended up in mathematics and will never need them for my “real life.” Yet we understand that these are important because many important professions exist for which having such skills and foundational knowledge are necessary. Mathematics is a language which abstracts the real world and explores human thought and this abstract nature is distasteful to many people. In my opinion this is OK! Teachers don’t need to force all students to like it or believe it will be useful to them individually – because it won’t. But we should teach about the existence of important professions that require expertise in mathematics (particularly algebra) and hopefully fuel an appreciation from students that the physical sciences seem to earn so easily. One question is: how do these intercepts and asymptotes interact? By this I mean, can we look at (say) graphs of the three addend functions and figure out how their sum will behave? As Howard points out (comment 14), the answer is sensitive to the coefficients involved. If we multiply one of the three addend functions by a nonzero coefficient, this won’t affect its x-intercepts or vertical asymptotes, but may affect the x-intercepts and asymptotes of the sum. This means that visually inspecting the addends can give us a hint of what to expect from the sum, but may not be conclusive. If we want to be sure about the behavior of the sum, going through the algebra seems indispensable. I’ll admit this is still abstract–why are we interested in those graphs, or the sum of those three functions, in the first place?–but using algebra to check or clarify graph-based hunches is a lot more interesting than just doing algebra for its own sake. f(x) = A/(x+1) + Bx/(x-6) + C(5x-2)/(x^2-5x-6) have exactly 1 vertical asymptote? f(x) = A/(x+1) + Bx/(x-6) + C(5x-2)/(x^2-5x-6) have no vertical asymptotes? * Do the above questions get easier if we write 5x-2 as a linear combination of x+1 and x-6? This is a nice conclusion to a couple of years of learning the theory of Algebra. The problem is schools are that it is rushed through and often the learners are lost in the first line. It is the way math is taught that causes the headache. It is definitely not the math. I am a massive fan of you and your work, Dan, but I disagree with the approach of this post. The feel that the study of modern Mathematics has far too much focus on real-world applications and job-world applications (Relevance is subjective). I understand this may sound a little unorthadox, but please hear me out. There is a beauty in Mathematics; learning for the sake of learning. It is through this beauty and aimless curiousity that we discover the unknown. We develop skills that appear to do not have an explicit use, that may (or may not) have a use in future. To put it simply, studying Mathematics for life/job skills is setting the bar too low. My wife has worked at the LHC in CERN, Switzerland during the search for the Higgs Boson. When people ask “What can we use it for when we properly understand it?” the answer is simply “We don’t know”. We dont know YET. Without the aimless curiousity, the search would never have begun. Pupils will begin to say boxers skip to make them fitter and better at boxing. I say that I have NEVER seen a boxer skip in the ring nor have I seen a pair of skipping ropes anywhere near a ring during a boxing match, so boxers are wasting their time with skipping ropes. The pupils are very quick to defend, saying that they build muscles and agility. I can them summarise by saying that they are doing so to build a skill to apply to unfamiliar situations. Then usually finish with an incredibly cringeworthly line like “Mathematics is skipping for the brain”. To summarise, the abstract, non-blatantly applicable elements of maths should not be seen as the enemy, but instead should be encouraged to enable our learners to become more broad, open-minded thinkers. I really enjoyed this post and think and it as a lot of good/enjoyable stuff in it (and in the comments section) and I hope you have time to read/reflect on my (lenthy) reply. Me too! That’s the premise of this series. Engagement can arise not just from relevant / real experience (whatever that means) but from the cognitive conflicts that propelled the history of math itself.